Serenade Pointe Shoe by Bloch. To get the best out of a Bloch Pointe shoe, please adhere to the below techniques for "breaking in" the shoe. Technique A and technique B are very similar; they differ due to two different paste types and two different construction techniques. A little extra time needs to be taken to break in these shoe types. They are made with a harder paste than Technique B and are therefore susceptible to "snapping" if treated roughly at first. Once broken correctly they have a long life span. 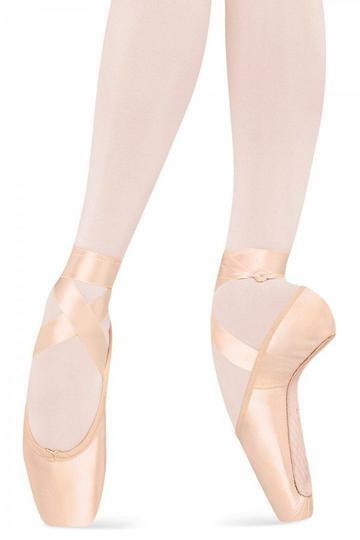 Doing barre is the best way to break in a pointe shoe. We understand however that you can't stand at the barre with a new pair of pointe shoes and expect to do a tendu, so the shoe needs to be prepared for barre by gently softening the shank and box by hand. Concentrate on the demi-pointe area of the shank being careful not to crush the box. Then work your way up to the heel gently massaging the shank until it is at a point where tendu and releve to demi-pointe is comfortable. Softening the box is not always necessary and is left up to the individual. If softening is necessary then concentrate on gently softening the sides of the box. Lots of dancers stand on the top of the box in order to soften and widen it. We advise that standing on the box or squashing the box can permanently damage the shoe. Please do so at your own risk. If you must stand on the box, you need to concentrate the pressure on either side of the box centre. This is important because the top centre of the box is the weakest point and prone to the most damage if stood on. Once the shoes are ready for barre, 1 to 2 hours barre will be a sufficient time to shape them to your foot. At this point the shoes will be evenly softened with no weak points resulted from incorrect breaking technique. These shoes are made from a paste that is designed to soften when moisture is applied. The technique here is simple to understand. Follow break in technique A. After 1 to 2 hours barre the shoe will become moist and shape itself to the dancers foot. Once the shoe dries it will have set in the shape of the dancers foot. At this point it is possible to apply Shellac to the inside of the block and shank. This will not only harden the shoe in its current shape, but also stop any more moisture entering the shoe. So we are left with a strong shoe, molded in the shape of the individual dancers foot on the inside, whilst leaving a quiet exterior.